Bishopstoke Park held a very enjoyable Summer Garden Party on Thursday 12 July. 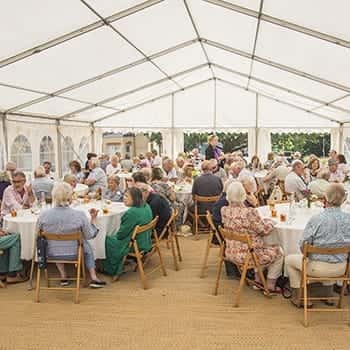 Residents and potential customers were invited to enjoy the sunny day at the retirement village in Hampshire with a Hog Roast BBQ, Pimms, strawberries and cream and live entertainment in the marquee from Harry Strutters Hot Four. Potential customers also had the opportunity to look around the beautiful development and speak to residents about what life is like living at Bishopstoke Park. Alison Frankel, who has been living at Bishopstoke Park for almost three years said she really enjoyed the event: "We were blessed with a lovely hot summers day, and what better way to show everyone the type of social life we enjoy and how happy and friendly it is living at Bishopstoke Park retirement village."